Discover the Giralda and The Maestranza in the easiest way from Madrid...By High Speed Train! This adventure starts at 7:00AM at Madrid Atocha train station where you will take the High Speed train to Sevilla Santa Justa Station. Remember we will send you the electronic train tickets after the booking process and just show them at the entrance. It takes only 2 hours 30 minutes! 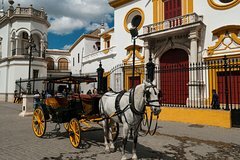 When you arrive to Sevilla, go to the Torre del Oro for to start the tour on the tourist bus, It is recommended to start at this point, although you can do it at any of the 15 stops along the way. You can make a free guide tour in Spanish/English (minimum people is required). Don´t forget that your Return train it´s at 7:45PM from Sevilla Santa Justa Station.